We think of Britain as a bastion of stability, security, and unity. This vision was always partly a myth, and it is now more distant than ever from political reality. 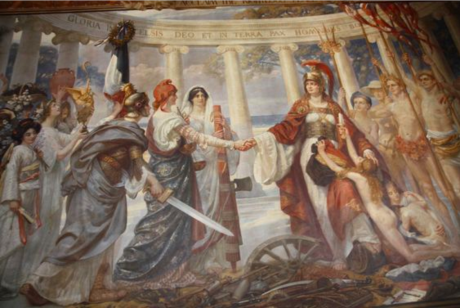 Sigismund Goetze's 'Britannia Pacificatrix' mural in the UK Foreign & Commonwealth office. Image: Wikimedia Commons. Public DomainThroughout its history, Britain has had a reputation for stability and security. This after all was one of the main clarion calls in Scotland’s indyref and, more recently, the Brexit vote. But it has always been a bit of a myth - and is now increasingly fictitious. Firstly, discussions supposedly about ‘Britain’ often collapse into discussions purely about England, and the south of England at that. In the European referendum and its aftermath, much of the discussion that occurred repeatedly - supposedly about the country, its challenges and future - wasn’t actually about the UK, but instead about England. This has become the way the country is presented by its elites. One glaring example of this was the previous week’s BBC post-vote analysis, ‘Brexit: The Battle for Britain’ which had lots to commend it. Politicians were candid, telling stories about decisions - and about each other. There were however two big problems with this. Firstly, it presented politics as the pastime of an insider class sitting in swish London offices and presiding over us, reducing the affairs of the state to nothing more than a spectator sport. In this light, the referendum seem less like a democratic affront to elitism and more like another spectacular act of political theatre. Secondly, and as seriously, was the problem of the missing Britain. In a one-hour programme, there was not one single, even tokenistic, reference to Scotland, Wales or Northern Ireland. Instead there was lots of discussion about London and its critical importance for the Remain vote. Apart from that, the only other geographic reference was to somewhere vague called ‘the North’. This apparently isn’t a very happy place, is filled with lots of disquiet and frustration, sense of loss, and inability to accept change. People stubbornly cling to their Northerliness and refuse to embrace Southernness. ‘The North’ was represented by three disgruntled and elderly working class men in a pub – who felt that all politicians lied and didn’t listen to people like them. And there was one woman - the Leave-voting Sam Adamson from Sunderland who stated that: ‘For the working-class people, it was like, ‘Yeah, you heard us – now do something about it’.” We will see how that works out. This is what shrunken dreams look like. This is what shrunken dreams look like. This Britain post-Brexit contained not one reference to Scottish independence and the prospect of any future referendum. Worse, there wasn’t one mention of the threat to the Northern Irish peace process, which has been dealt a severe blow by the hauling out of Europe of the UK. Many people, particularly in London elites, will say that these divisions have always existed as they currently do. But that’s not true; they are in fact getting worse. Two conceptions of ‘Britain’ characterise and feed into this spiral of deepening divisions. One is the vision held by ‘winner Britain’: the view of those who have made it, think they can make it, or hang on to the coat tails of this class. They tell themselves they are a cosmopolitan, outward focused group – but only with time for similar minded people. This was one of the defining features of the Brexit debate – that the Remain side and the large parts of the London media couldn’t understand anything beyond this class. Any opposition, from places such as ‘the North’ was about handing on to the past, or worse, about being losers. The second factor is the emergence of an English nationalism – which in large part presents itself in opposition to the above. It claims that in recent decades we have ‘lost’ control of our country – to immigrants, the PC brigade, and Europe – and now is the time to ‘take it back’. Yet, the very idea of Britain as a coherent political entity (to which both of these visions lay claim) is now in terminal decline. Once upon a time, this idea was one which united experts, elites and large parts of the general public. It seems hard to believe now, but Britain was once powerfully associated with forces of good and enlightenment: lifting up millions in this country post-1945 out of poverty, and providing a whole generation of working class people opportunities denied their parents and grandparents. The last forty years have seen the institutions which make up the British establishment and state embark on a political revolution which has turned the country and our lives upside down. This has produced not just a constitutional crisis, but also an economic, social and democratic one. These institutions underwrote Britain’s stability; and as they have crumbled, so has the legitimacy of this united and uniting vision of the country. These liberal democratic institutions are the bedrock of the politics we have helped give to the world, exporting them to the quarter of the planet over which Britain once ruled. Many have argued that it has produced its positives at great cost to these countries. Whatever the truths of these critiques, one thing has become clear: that in the western countries for whom these positives were supposedly acquired, it has been an utter disaster. In the UK, US and elsewhere, wages and living standards have stagnated, while a microscopic elite, who represent at most 0.1% of respective populations, have enriched themselves at our expense. In previous eras, the villains of a capitalism gone wrong were smallscale, almost comic - Peter Rachman, Tiny Rowland (who inspired ‘the phrase “the unacceptable face of capitalism”), and Gerald Ratner (who said his products were ‘total crap’). But now the individual villains are everywhere - Philip Green, Dominic Chappell, Mike Ashley - while the real crooks remain private. This narrow-band version of Britain has grown increasingly strong in recent decades, and crowded out progressive and more inclusive versions. The country that was regularly celebrated in the indyref as ‘the greatest union in human history’, and in the Brexit debate, as ‘a partnership of equal nations’, has been revealed as nothing of the kind. Any idea of partnership isn’t equal or consensual and democratic; certainly not for Scotland and Northern Ireland in the recent referendum, or economically and socially, for most of the UK. Bizarrely, despite all this, most elements of the centre-left, including the Labour Party, don’t understand the above or want to talk about and challenge it – still seeing the main task of UK politics as the politics of the centre – not grasping that is a huge part of the problems facing us: the global Britain of winners and a narrow class perspective presented as a world view. This has been reinforced by the fossilised elements of the British state, territorial politics, and a reactionary British nationalism. Why the mainstream centre-left still don’t position themselves in opposition to this, even under Jeremy Corbyn’s Labour, shows the ingrained conservatism and commitment to the norms of British traditions in even radical circles. There can be no going back to the old Britain of security and stability. But this is also true for Scotland. This is the age of disruption and shaking things up, not patching them together, and the only way to address the problems of Britain isn’t by yearning for the way things used to be, but by embracing radicalism and challenging the new elites. And that requires a much more ambitious and detailed radicalism – economic, social and democratic - than what we have seen so far from disrupters such as the SNP and Jeremy Corbyn, and even dare I say it, from UKIP.